join me at upcoming events! 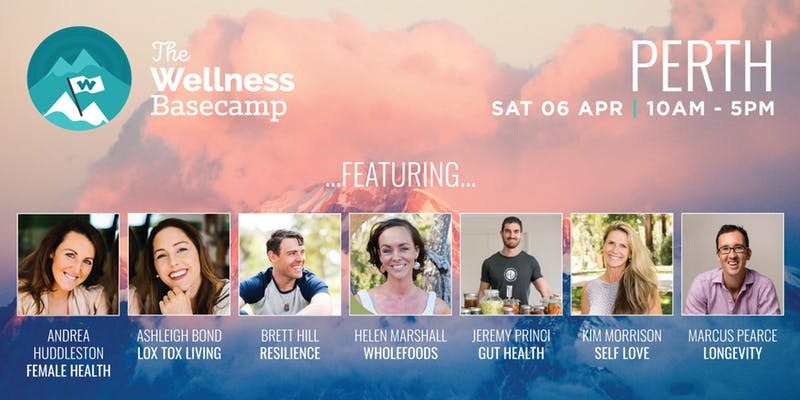 The Wellness Basecamp is a one-day wellness extravaganza featuring experts on topics including nutrition, self-care, mindfulness and mindset, life management, relationships and more. You’ll find The Wellness Basecamp relevant, inspiring, informative and entertaining. And most of all, you’ll develop a community of like-minded people as you continue on your wellness adventure. Over the course of one jam-packed, inspo-filled day you will be taken on an adventure of education, entertainment and empowerment in the pursuit that you will be inspired to play a bigger game in your own life (no matter how big or small it already is). FOLLOW THE PURCHASE BUTTON TO GET 50% OFF THE REGULAR PRICE OF TICKETS!!! Focusing on the healing power of eating natural and nutritious foods to combat some of the most common health issues prevalent in today’s population. Come and join us as Dr Damian Kristof, a leading health and wellness expert, will walk us through the importance of what we eat to ensure optimal health. Click here to register and secure your ticket. I’ll see you there! DOWNLOAD YOUR 12 PAGE EBOOK - 25 TOP TIPS FOR LIVING LOW TOX - BE CLEANER, GREENER, AND HEALTHIER! Thank you! Your guide is on its way to your inbox! Australian Registered Chiropractor (B.Chiro.Sc., M.Chiro), Holistic Lifestyle Coach (CHEK1), Women’s Wellness & Birth Educator, wholefoods-loving mama, salt water and sunshine seeker, inspired by love for people & authentic living. If you would like to book Dr Ashleigh for an interview, podcast recording, or other media event, please download this media kit. Experience a new range of luxurious 100% organic essential oil blends. Organic Abodes is my lifestyle range of organic home and body products harnessing the therapeutic benefits of single origin, certified organic essential oils. Enjoy balancing body and room mists, and roll-on blends, designed for mums and bubs. Gift to yourself, or share with friends, these high quality essential oil products have the power to harmonise mood & energy. Copyright © 2019 Dr. Ashleigh Bond. All rights reserved. This site is intended for information purposes only and does not constitute or replace medical advice. Disclaimer and Legal Information can be viewed HERE.